Since the Ivy League is the only conference that does not have a postseason tourney, Harvard was 1 of the 1st teams to earn an automatic bid to this week’s NCAA tournament. The Crimson lost to Vanderbilt in last year’s tourney, and started off this season by having 2 players forced to withdraw from school due to a cheating scandal, but the team bounced back in 2013 to claim the school’s 2nd straight NCAA tourney bid. 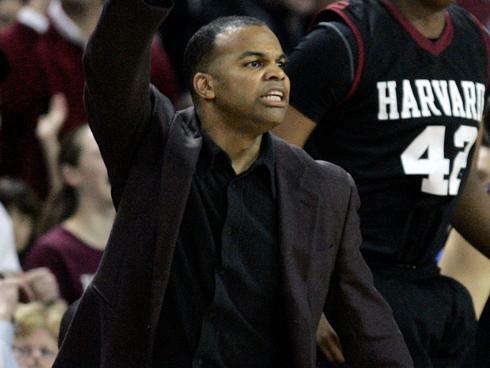 Earlier today Jon Teitel got to sit in on a conference call with Coach Tommy Amaker and players Laurent Rivard/Christian Webster about what it feels like to make the tourney again. It was a wonderful moment for this group of guys to hear our name called on the selection show. We know internally how hard the Ivy schedule can be due to not having a conference tourney. We know that we have a long trip ahead of use with a short turnaround against an opponent who had a sensational season. We joked around a little bit regarding whether the committee forgot about us because they did not call our name until late in the show! There was jubilation in the room when that happened, so I did not hear anything after that. I think people recognize the talent and ability of New Mexico, so we are starting to assemble and breakdown as much game film as we can. They have a lot of size up front and a lot of different guys who can score, even their guards have good size. They have played a lot of tough opponents and are not a #3-seed for nothing. Coach Alford and I go back a long way, and I consider him to be a good friend. My final game as a collegiate player was a six-point loss to Steve’s Indiana team in 1987 the Sweet 16 in Cincinnati. I could never have imagined when he and I were both All-Americans back then that we would end up coaching against each other in the tourney, but I have a lot of respect for him. I got to play in the national title game as a junior in 1986, but the Hoosiers had an outstanding team in 1987. I do not recall if I had to guard Steve, but I hope not because he was such a great scorer! Our two captains have embraced their role of leading the team, and our freshman point guard Siyani Chambers has done a great job of maximizing who he is and where he is. The loss of two players to suspension at the start of the season hurt us, but we looked at it as a unique opportunity to deal with a challenge. When you have a point of reference like playing in last year’s tourney, it gives you a different comfort level. Laurent (Rivard) had a sensational game against Vanderbilt and kept us in it. I doubt we will play perfectly, but hopefully our experience from last year will serve us well. People thought that we would not get to this point due to all of our adversity, but I am so proud of my teammates and coaches for believing in us. We will be a little more confident and relaxed due to the experience we got from last year’s tourney loss to Vanderbilt. The NCAA tourney is a big deal and we were a little nervous last year, but this year we can just play ball and focus on the game. Ever since we were kids this is something we have dreamed of being a part of, so hopefully the experience will help us this year. At Harvard academics come first and basketball comes second, so we have to get our work done on the court as well as off the court. If you look at us from earlier in the season until now it is like another world: we have gotten so much better at living up to our high standards. The NCAA tourney is a big deal even in Canada, and it is great to have so many players doing well on so many good teams like Gonzaga’s Kelly Olynyk and UNLV’s Anthony Bennett. It is great for the younger players to see us succeed, so we try to show them that anything is possible.